The University's "Bama By Distance" continuing education program is being featured in the heart of the Big Apple. NEW YORK -- The University of Alabama is now on the big screen....in Times Square! The University's "Bama By Distance" continuing education program is being featured on the CBS television network’s Super Screen located at 42nd Street between 7th and 8th Avenues in the heart of Times Square Plaza. The video runs twice each hour for 18 hours per day through April. With all the excitement of having the Crimson Tide basketball team representing the University in the NIT, the Division of Academic Outreach is taking the opportunity to promote its learning opportunities for students everywhere. So make sure to take a stroll through Times Square sometime soon to see the Capstone featured in the Big Apple. 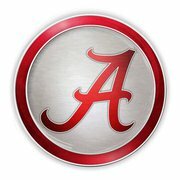 To learn more about the College of Continuing Studies, visit BamaByDistance.ua.edu.